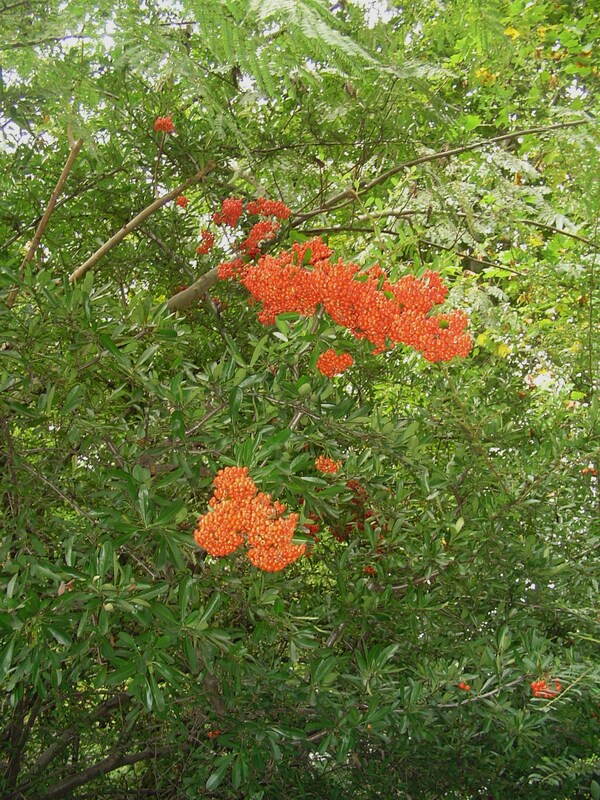 Pyracantha: Love it or hate it. Most of us have a strong opinion about this fast growing shrub. We love Pyracantha for its beautiful fall berries, more correctly called “pomes”, which turn bright red, red orange, orange, or yellow, depending on the cultivar, in autumn. The berries are beautiful in the landscape, in cut flower arrangements and wreathes; and they attract songbirds. Cedar waxwings, cardinals, blue jays, and many other back yard birds feast on the berries in late autumn. Considered poisonous for humans, the berries are mildly hallucinogenic for birds. This Pyracantha shrub is over 15 feet tall and wide. Pyracantha, closely related to Cottoneaster, is beautiful espaliered against a wall; grown as a hedge or against a privacy fence; or even grown as ground cover on a bank. Its beautiful white spring flowers are an important source of nectar for bees and other nectar loving insects. Its evergreen leaves are neat and look good year round. Its dense, thorny habit provides great cover for birds and gives them very secure nesting sites. These are Pyracantha’s good qualities, and reasons why I like having it in the garden. 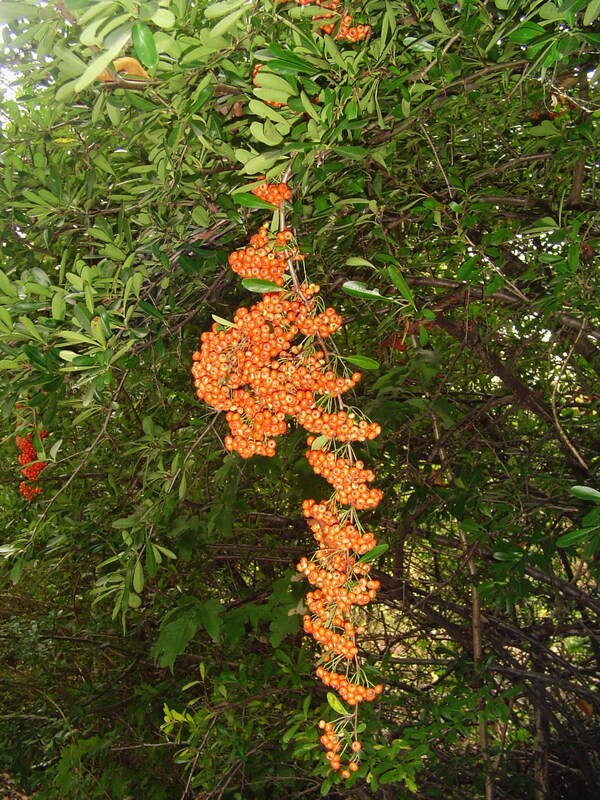 Now, the bad: Pyracantha is very large; is covered with very long, sharp thorns; and grows with a mind of its own. It is a fast grower, and so may need trimming back several times in a season to keep it in check if grown near your home. Since it blooms and sets fruit on old wood, hard pruning may mean sacrificing the berry crop for the coming year. Once pruned, it sends up new growth in many directions at once. You almost need “staff” to look after it properly if you want to keep it manicured. Some varieties will reseed around the garden. If grown near pathways, its thorns may reach out to grab you, which brings us back to its positive qualities. Those same thorns which make it difficult to prune, also make it an excellent hedging plant. If you want extra security around the perimeter of your property, Pyracantha is an excellent choice. I once had a garden which backed along a busy neighborhood thoroughfare. Although I had an 8′ privacy fence, I also planted shrubs on both the inner and outer sides of that fence. Azaleas and Camellias went on the outside visible from the street, but I grew some Pyracantha on the inside where it might be tempting to climb across. Pyracantha grown along fences and property lines can reinforce boundaries against humans, deer, neighborhood dogs, and others you might want to discourage. Hardy in Zones 5-9, Pyracantha grows well in a variety of soils and in anything from full sun to partial shade. There is more berry production in good sunlight, but the plant tolerates a wide range of conditions. Native to parts of Europe and Asia, Pyracantha is definitely an import in the United States. It is one of those plants where many hybrids and cultivars are available to suit your need for size, growth habit, and berry color. Once it is established, it’s drought tolerant and hardy, with few problems from disease or insects. It doesn’t need fertilizer or any special care. Pyrancantha berries, just beginning to turn color. One of the nicest things is the ease with which Pyracantha roots. I’ve taken stem cuttings in late spring (also called “prunings”), dipped the lower cut into rooting hormone, and simply stuck them a few inches into the soil where I wanted a new shrub to grow. This is how I cultivated a hedge along that privacy fence. After watering them in, I just kept an eye on them until new growth appeared. Not every cutting rooted, but enough did that the purpose was served. Keep in mind that most commonly available cultivars will grow to between 10′ and 20′ tall within five years. If left alone, most will also get quite wide. In fact, I am planning to take cuttings from my current plants, and hope to establish a lovely thorny hedge in the areas of the garden where the Bambis still try to penetrate our barriers. Pyracantha is one of those shrubs we haven’t seen them grazing. 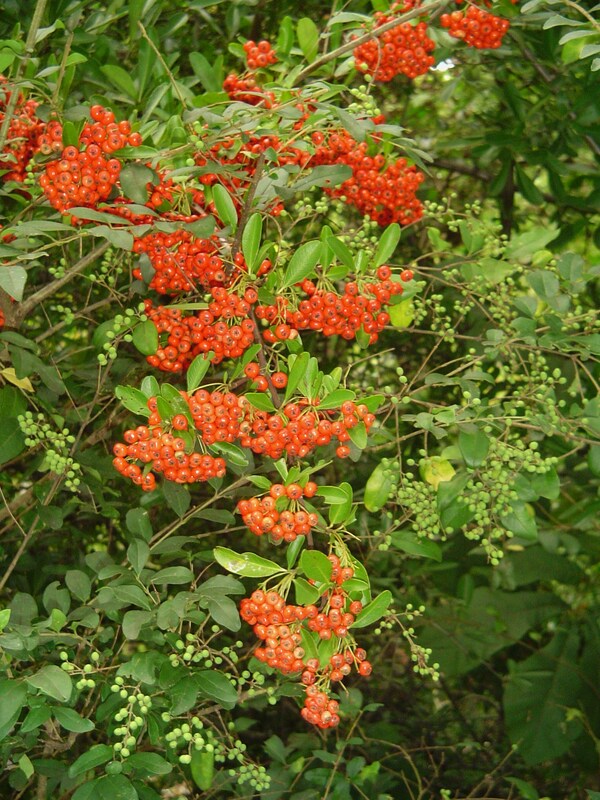 So we choose to love Pyracantha, but also keep a healthy distance from it. I’m not a native plant purist, and so appreciate its benefits in a wildlife friendly forest garden. We love its beautiful berries, and we love seeing the crazed antics of the birds eating them. It is an utterly undemanding, unfussy, dependable shrub; and it shines in autumn when its berries brighten and its green leaves hang on tight into the winter. 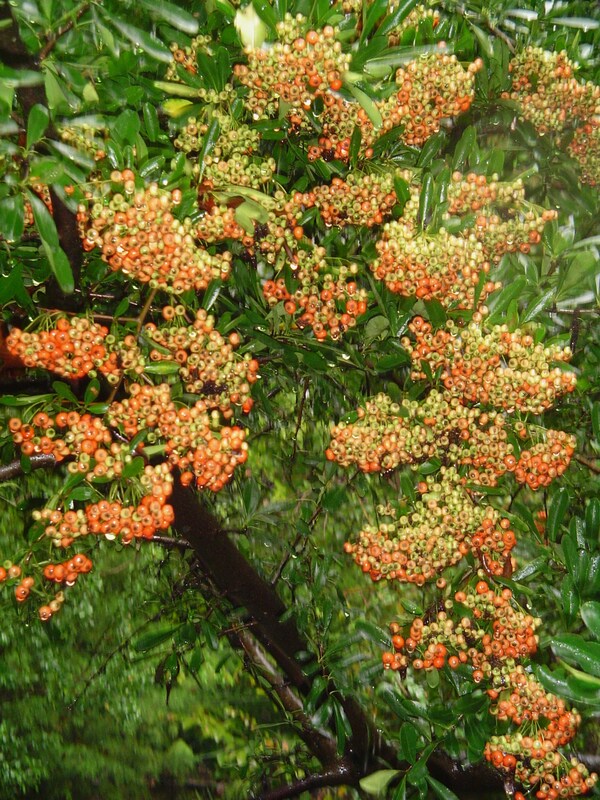 A branch of Pyracantha berries in mid-summer. Sounds like this plant has a mind of its own! Too soon! We’ll be down in the 30s at night by mid-week, so the time is here to begin moving pots indoors. Would love a cutting or two, pls.